Hon Elijah Memusi yesterday made a passionate speech in parliament which became his maiden speech. 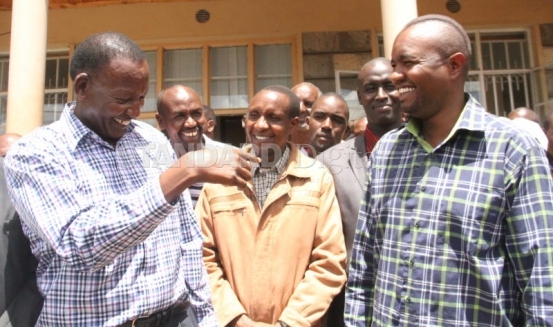 In the speech, the new Kajiado leader called on his colleagues to restore the image of parliament now dented with allegations of corruption. Memusi hit at Jubilee Alliance for practising ‘politics of money’, and thanked ‘peasants who rejected thousands of shillings’ to elect a good leader. •Mr. Speaker I take this early opportunity to thank all of those who made it possible for me to be a member of this August house. •Today would not have been possible if God had not willed it. The scripture says; “Unless the LORD builds the house, those who build it labour in vain.” Yes, we labored, but not in vain because the Lord is on our side. •So, to God, the Almighty, the owner of time and season, we owe our debt of gratitude for a day like this. •I thank the Great people of Kajiado Central who stood up to a massive barrage of propaganda, crude threats, bribery ,abuse of power and empty promises but they still voted for the best candidate. Indeed ours was a victory of the common man against the tyranny of power. •To the good people of Kajiado central goes my unflinching gratitude. We salute your steadfastness, courage, loyalty, commitment and fierce determination to defend your sovereign rights. You have demonstrated in this election that in a democracy, power truly belongs to the people. I am humbled and honored by your trust and abiding faith in me and my party. I pledge that your confidence in us shall never be betrayed or taken for granted. •My heart goes out to the youth and women of Kajiado central who irrespective of tribe, religion and social class voted overwhelmingly for change. I shall forever remain indebted to you for your selfless sacrifice. I assure you that I will work tirelessly to positively transform your lives in the 2 years before the next election. •The outcome of this election, once again, shows the unswerving determination of our people to ensure that democracy triumphs in Kenya. We have sent a strong signal to all and sundry that no might is powerful enough to thwart the will of the people. This should always strengthen our resolve to ensure that as from now on, every vote must not only be counted but must count in this country. Nobody or party must ever exercise power unreasonably at any level except in accordance with the will of the people to whom sovereignty belongs. •I pay particular tribute to the CORD fraternity led by the 3 principals. •I salute The Rt. Hon. Raila Odinga, a man who has given 4 decades of his life to the selfless struggle for freedom democracy equity and justice. Mr. Odinga has overcome immense challenges and made enormous personal sacrifices so that Kenya can be progressive, prosperous and democratic. Mr. Odinga brought his charisma and oratory prowess to Kajiado Central. Indeed I now know why he is referred to as the enigma of Kenyan politics. I ask God to bless him for all this. •I pay tribute to His Excellency Stephen Kalonzo Musyoka a man who exemplifies servant leadership and principled politics. I had occasion to witness first hand his silent but steadfast commitment to principled politics during the campaign. I also learnt a lot from the man who is Kenya’s most accomplished diplomat who brought peace to Sudan and Somalia. I thank him. •I commend the Hon. Moses Masika Wetangula a steadfast and selfless voice for equality. His courage and energy on the campaign trail was exemplary. •I must at this point congratulate the CORD campaign committee in charge of my reelection. It was headed by Hon. Junet Mohammed a fearless man who stood by me all the way, a man whose hawkeyed watch ensured that those engaging in electoral malpractices were arrested, a man who helped to reduce all avenues of digital rigging. God bless you Hon Junet. •I thank the treasurer of the CORD election committee, Dr. Evans Kidero.His solid input and sound advice was very helpful. •To my Governor David Nkedianye I salute you for your selfless support. We will walk together to develop Kajiado and take it to even greater heights. •Mr. Speaker I thank the members of the CORD coalition who supported me both materially and morally. Your presence before during and after the election day was crucial to my victory. Words cannot express my gratitude to the over 100 MP’s who left their personal and professional engagements to campaign for me. •Mr. Speaker I must Salute the support received from all Kenyans I have received messages of goodwill from all corners of this country from Lamu to Lokituang from Mumias to Mandera. I thank them I will not let you down. •To the members of the Maa community from as far off as Samburu and Laikipia in the North to Narok and Arusha in the west they have affirmed that we are a proud people who are not visitors in Kenya. We seek to work with all Kenyans based on mutual respect and recognition that we are masters of our own destiny we are not an experimental ground for ideologically bankrupt parties. I particularly recognize the efforts of the respected and visionary Maasai leader The Hon. William Ronkorua Ole Ntimama his support was much appreciated. It sent a crucial message to those who have abandoned our African culture which respects age and the elderly; it was a decisive blow on those who had the temerity to refer to Hon. Ntimama as Vasco da Gama. They now know that Ntimama still retains clout and respect. I urge them to go to Narok and seek his forgiveness before it is too late. •As I embark on my parliamentary duties let me recognize that democracy in Kenya cannot survive without CDF. We now see wananchi who are not intimidated by the tyranny of power because resources are devolved both to counties and to constituencies. The abolition of CDF cannot be allowed to happen if we want to safeguard democracy. •Mr. Speaker as I embark on my parliamentary career I would like to say that we all know of unfounded and yet to be proven allegations of corruption and malfeasance that hang over this house. I urge members that we should all emulate the people of Kajiado central who refused to be swayed by money and coercion and voted with their conscience. If a humble peasant can refuse thousands of shillings to sell their birthright to elect a good leader I believe that members of this house have always and will always behave in a manner above reproach. •As all members prepare for the future I urge them to leave a clean and spotless record of selfless service and prudent management of public resources. •I thank you Madam speaker for your attention and giving me this opportunity and look forward to working with your office as embark on my nascent political career. Tags: Cord Home Family., Hon Elijah MemusiCategories: Home.